ALLEN PARK -- Lions quarterback Drew Stanton took reps with the starters in practice today (Tuesday). Shaun Hill and Matthew Stafford were on the field, but not participating in the first practice since the Thanksgiving loss to New England. It is unknown at this point what is wrong with Hill who started and finished Thursday’s game. After that loss he said Patriots were literally trying to re-break his left forearm. Stafford said on a radio show Monday night he will start throwing lightly this week. But he was not throwing at all during the media portion of practice. It’s possible coach Jim Schwartz could explain the quarterback situation when practice finishes. Stanton has started one game in his career. That was last season at San Francisco. Also missing from practice was DE Kyle Vanden Bosch who could not finish Thursday’s game. Turk McBride was getting his reps at practice. Right tackle Gosder Cherilus also didn’t finish the game. He did not practice, but was on the field while Corey Hilliard filled in at his position. Running back Jahvid Best also did not practice. Kicker Jason Hanson (knee) was on the field, but the media did not see any special teams practice. Dave Rayner was also on the field. In a radio interview Monday night, Lions quarterback Matthew Stafford said he expects to start throwing lightly this week. Stafford injured his shoulder on Nov. 7 in the loss to the Jets. His first shoulder injury this season occurred in the season opener and it took him six weeks to get back on the field. No one is saying if this injury is similar, but if it would take six weeks he could be back for the final two or three games. What difference would it make? Well, it would benefit Stafford’s development which has been stunted for two seasons by three shoulder injuries and minor knee surgery. It would also give a boost to the Lions who need it after winning just two of their first 11 games. Coach Jim Schwartz has never set a timetable on Stafford’s return. But he has said if he’s healthy he’ll get him in even if it’s just for a game or two. The Lions didn’t practice on Monday so they could have a three-day weekend following the Thanksgiving game. They will practice on Tuesday afternoon. Why? Why? Why? So many questions involving the Detroit Lions and so few answers. Of course, the key head-scratcher is why haven’t the Lions won more games considering their roster is more talented than a year ago? Really no one good answer there. Injuries, bad luck, no breaks from the officials, they beat themselves, the inconsistent secondary -- pick one or all of the above. 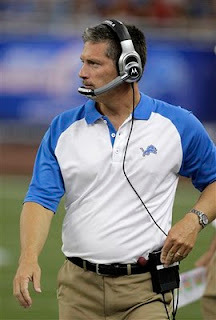 Here’s the other “why” starting to creep into my e-mail bag: Why is Jim Schwartz not on the hot seat? That’s easy. Here are five reasons why Schwartz’s job is secure. 1. Despite the heart-breaking close losses that started with that Calvin Johnson call in the opener at Chicago, Schwartz has kept the team’s spirits in fighting mode. After a disappointing 2-9 start he could have lost the team. That has not happened. 2. Except for a few plays over 11 games (the Jets’ loss comes to mind), Schwartz has not been out-coached. The Lions are prepared, the guys will tell you that. When it comes to basics during the week and on Sunday, Schwartz has proven that he’s got what it takes to be an NFL head coach. 3. Schwartz and general manager Martin Mayhew are on the same page as far as a team-building philosophy. While naturally they want to win now, they are also building for the future. 4. Firing Schwartz would make zero sense. Think it would be wise to tear everything apart and start over? Absolutely not. The Lions’ record may be the same as it was at this time a year ago, but they are closer to becoming a winning team. 5. Even Rich Rodriguez got more than two seasons. Perhaps lost in the Lions’ 2-9 record is the Herculean effort of return specialist Stefan Logan. In Thursday’s loss to the Patriots, Logan averagd nearly 28 yards per kickoff return. Plus he notched a tackle on a Lions’ kickoff. Returns were an issue all last season. The roster was so shaky that the Lions couldn’t afford to have a returner who was just a returner. That changed a bit this season so Logan was claimed off waivers on Sept. 6. And actually he is more than a returner. He plays on all special teams units and has lined up at wide receiver. It was another good move by Mayhew. When he returned a punt 71 yards against the Redskins a few weeks ago, he became the first Lion in franchise history to return a 100-yard kickoff and a punt return for at least 70 yards. No wonder he’s can be a forgotten man. He’s only 5-foot-6 and 180 pounds. Kyle Vanden Bosch, Corey Williams and Nate Burleson were all quality offseason acquisitions for the Lions. But perhaps quarterback Shaun Hill should be at the top of the list. With Matthew Stafford two shoulder injuries, Hill has started eight of the first 11 games. While he’s notched just one win, he hasn’t been the reason for the losses. Without Hill this team would be in much worse shape. Hill has proven his toughness in recent weeks playing with a broken left forearm. It’s not been quite six weeks since the break and he’s started three games. Basically he’s been playing with a broken arm. He was cleared by doctors, but even coach Jim Schwartz has admitted the obvious. Then Hill said on Thanksgiving, on a quarterback draw, the Patriots were literally trying to re-break his arm. Toward the end of the game when the minutes were meaningless, coach Jim Schwartz offered him the chance to leave the game and it was his option to stay in. The offensive line has done a good job of protecting him. He’s prepared and his increasing comfort level is apparent. If the whole team played with as much heart as Hill, the record just might be a little better than 2-9. If it was easier, I’d dig through my blogs from last season, to find one I’d written about the Lions’ defense giving up big plays. I’m sure I wrote one or two on the subject, but let’s start anew. This Lions defense should be better that they are playing. One of their goals is to prevent chunk plays. It was their downfall in Thursday’s 45-24 loss to New England. Of the Patriots’ 53 offensive plays, 11 of them were for 15 yards or longer. Four of those were passing touchdowns of 79 yards, 26 yards, 22 yards and 16 yards. Tom Brady is good, but the Lions defense helped him to a perfect passing record of 158.3, only the second of his career. Much of the blame can be placed on the shoulders of cornerback Alphonso Smith who had an atrocious day and, to his credit, afterward pointed the finger at himself for losing the game. “They went after him. He didn’t play his best. He’s played very well for us this year. He made a lot of plays for us. But this game wasn’t one of his best games. It was probably a lot of things but one of which was trying to do too much,’’ coach Jim Schwartz said. Smith was eventually benched, but the damage was done. Still it was not all on him. You win as a team and lose as a team. DETROIT -- Cliff Avril who had been questionable for today’s game will play against the Patriots today. Avril missed the last two games with a quadriceps injury. The Lions will be playing with just three defensive ends with Lawrence Jackson (concussion) out and rookie Willie Young inactive. Tight end Tony Scheffler (rib) was doubtful and will not see action today. Zac Robinson is designated as the third quarterback. Other inactives are QB Matthew Stafford (shoulder), K Jason Hanson (knee), T Jason Fox and G Daniel Thomas. 1. Play with anger on every snap in every quarter in every minute. 2. Find some way to run the ball by sharing snaps with Jahvid Best on a limited basis. Maurice Morris needs to step up like he did last week with 10 carries at Dallas. Jerome Felton likely blew his chance to be a part of the offense when he fumbled the ball in the third quarter against the Cowboys. 3. Again, get the ball to Calvin Johnson. No explanation necessary. 4. Defense must stop Tom Brady from making big plays. This is a tall order, but it can be done. 5. Special teams must do its share. It’s not good enough to be error-free, they are counted on for good field position and perhaps a score would not hurt. It’s becoming a weekly ritual. The officials make a questionable call on the Lions, it makes a huge difference in the outcome of the game and Lions fans shake their heads and ask when it will stop. It’s not a good ritual. At Dallas, Ndamukong Suh was penalized for a horse collar tackle when it clearly was not. It is legal to grab a player’s hair. Suh said he had all hair in his hands. “His hair is long enough to go probably midway down his back, just covering up his collar. If you go back on replay I just tugged it and jumped on his back, I went up to apologize, I’m not a dirty player. At that point in time the only thing for me to grab was his hair,’’ Suh said. Barber told him not to worry about it. “I felt it was a clean play and all my teammates rallied behind me,’’ Suh said. It was one of 10 penalties in the game. The Lions are the second-most penalized team in the NFL. So officials are not going to give them a break. It shouldn’t be that way, but it is. Not saying the Lions are blameless. They have to clean up their penalties especially before the snap and after the whistle. A good time to start would be Thursday when they face the New England Patriots. But they won’t get any breaks until they start winning. It’s a total Catch 22. ALLEN PARK -- It’s difficult to judge the important absences at Lions practice today (Tuesday) because it’s a different week with the quick turn-around from Sunday to Thanksgiving. Running back Jahvid Best, who usually doesn’t practice until Friday during a normal week, was on the field. Defensive ends Kyle Vanden Bosch and Corey Williams (shoulder) did not participate in practice. While it appeared Cliff Avril was on the field in a limited basis. Avril has missed the last two games due to his quadriceps injury. Linebacker Isaiah Ekejiuba, who has missed the last three games with a knee injury, practiced. Tight end Tony Scheffler, who injured his ribs on Sunday, sat out. As did quarterback Matthew Stafford who has missed the last two games with a shoulder injury. Also, kicker Jason Hanson did not kick. The Lions play the Patriots at 12:30 p.m. on Thursday at Ford Field. 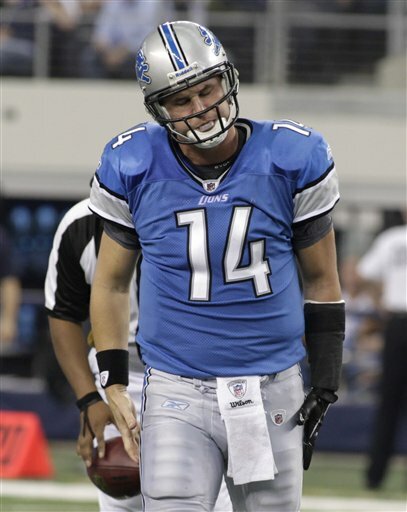 ALLEN PARK -- Shaun Hill will start again at quarterback on Thanksgiving when the Lions play the New England Patriots in a nationally televised game from Ford Field. Without giving specifics, coach Jim Schwartz said Matthew Stafford is progressing well in the rehab of his shoulder injury but Hill will get another start. Schwartz said he would know more on Tuesday if kicker Jason Hanson would be able to play after missing two games with a knee injury. Also, defensive end Cliff Avril (quadriceps) has missed two games, but the decision on whether he will play could wait until Wednesday or game day. Tight end Tony Scheffler injured his ribs on Sunday in the loss at Dallas and wasn’t able to re-enter the game. His status is also a question mark. With the quick turn-around to play again on Thursday, the Lions have to move forward quickly. The players had a walk-through late Monday afternoon and will practice on Tuesday as they would a normal Wednesday. Schwartz said the coaches worked on the game plan late Sunday after the trip back from Dallas. IRVING, Texas -- Perhaps it’s a good thing that the Lions (2-8) don’t have time to reflect on Sunday’s 35-19 loss to the Cowboys at Dallas. There were glimpses, but the same old woes prevailed -- ineffective running game, too many penalties and costly missed tackles. And this was against a Dallas team that is just 3-7. Here’s the thing, looking forward the view does not improve. The Lions have a short turn-around to prepare for their nationally televised Thanksgiving game against the New England Patriots (8-2). 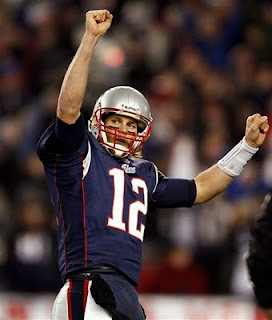 Tom Brady and the Patriots edged out the Indianapolis Colts on Sunday. Brady finished with a 123.1 quarterback rating after completing 19 of 25 passes for 186 yards with a pair of touchdowns and zero interceptions. The Pats use a balanced offensive attack with 168 yards rushing and 178 yards passing. This will be one of the biggest challenges yet this season for the battered and bruised Lions. Shaun Hill is highly likely to be the starter again. Jahvid Best carried only three times against the Cowboys. His turf toes (he has them on both feet) are not improving. Perhaps they should just sit him. But it’s hard without Kevin Smith who is done for the season due to thumb surgery. 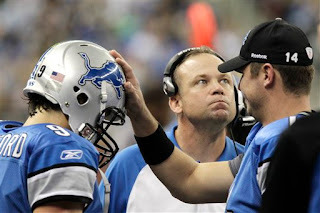 The only thing the Lions have going for them is they are playing in the friendly confines of Ford Field. Still it could be extremely rough. Maybe we’ll see them dig deep. But this has not been the same team since the loss to the Jets. They talk about bouncing back, but they have to prove it. Thursday would be a good time to start. ARLINGTON, Texas -- Wide receiver Bryant Johnson, who has struggled all season, is inactive for today’s game against the Cowboys. He had nine receptions in the first nine games. Isaiah Ekejiuba (knee) is out and will likely be replaced on special teams by Caleb Campbell who was activated from the practice squad on Saturday. It will be Campbell’s first NFL game. No other surprises on the inactive list. Matthew Stafford, Cliff Avril and Jason Hanson were listed as out on Friday’s injury report. Turk McBride will start for Avril. Also inactive today are rookies Jason Fox and Willie Young. Zac Robinson will serve as the third quarterback. IRVING, Texas -- With the running game a weak spot in the Lions’ offense, word that running back Kevin Smith is lost for the rest of the season is not good. Smith tore a ligament in his right thumb last Sunday against the Bills. He had surgery on Thursday and his hand is in a bulky cast. He was placed on injured reserve on Saturday. Expect Jerome Felton and Aaron Brown to get more carries today against the Cowboys. Although if Jahvid Best, who has been bothered by turf toe, gets off to a good start, I would expect they will stay with him. They will re-evaluate the situation after today’s game because there’s a quick turn-around before they play the Patriots on Thanksgiving. 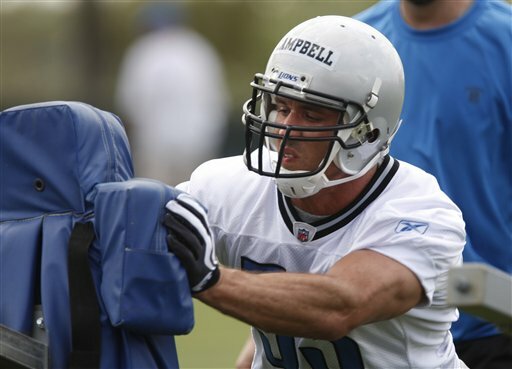 With the roster spot, the Lions activated LB Caleb Campbell from the practice squad. Expect to see him on special teams today in his first every NFL game. If he wasn’t going to be on the 45-man active roster I don’t think they would have activated him. It should be an interesting afternoon. 1. Run the ball. Heard this before? The stalled running game has been an issue all season. It just gets tougher today because the Lions will be without Kevin Smith who had thumb surgery this week. Aaron Brown should take advantage of this opportunity. Will he? 2. Protect quarterback Shaun Hill. He was sacked just once last week, the offensive line must keep that up. Each member of the line had a false start or hold penalty last week and it could be because more than ever they knew Hill had to be protected. He had been cleared by doctors, but even a few of his teammates admitted they knew he was playing with a broken arm. 3. Get the ball to Calvin Johnson. Seriously. 4. Pressure Cowboys quarterback Jon Kitna who will be getting his second start. The Cowboys have been better passing than running, don’t let them get started. 5. Stop the big play. Just one can long run or pass can kill any hopes of a win. We’ve seen it all season. 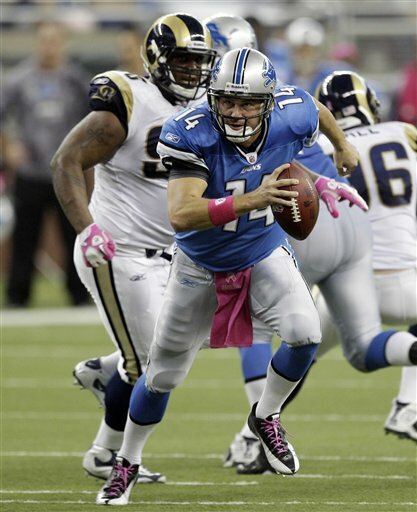 Every week it’s a balancing act for Jahvid Best and the Lions. The Lions’ rookie running back has been dealing with turf toe -- first on one foot, then the other -- all season. Rest is the best medicine, but that won’t come until January. So during the week he rarely practices, so the toe will be OK on Sundays. The coach said that Best knows what to do and doesn’t have a problem with missed assignments. “But when you talk about consistency in the run game and everybody being on the same page and things like that, there’s something with practice. He missed a lot of practice early in the season with it and had been practicing but it’s a situation now where you just don’t want to irritate it too much during the week and try to get him to Sunday,’’ Schwartz said. The running game has struggled utilizing both Best and Kevin Smith. On Sunday at Dallas they will be without Smith who had surgery on his thumb on Thursday. Expect Jerome Felton to get more carries and Aaron Brown to be activated to help fill the gap without Smith. ALLEN PARK -- Kicker Jason Hanson, who is rehabbing an injured right knee, hopes to return to action for the sold-out Thanksgiving Day game against the Patriots. Same for defensive end Cliff Avril who hasn’t been able to practice because of a quadriceps bruise. Neither is sure that they will be ready, but it’s the goal for both. Both said today (Thursday) they do not expect to be ready to play on Sunday at Dallas. Neither played in the loss at Buffalo on Sunday. The sell-out lifts the local TV blackout. The game will air on CBS. Could this have something to do with the half-time entertainment? 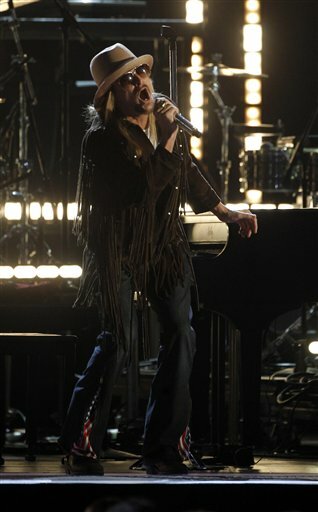 It was announced earlier this week that Kid Rock will perform in the United Way half-time show at Ford Field. The Lions have lost six straight on Thanksgiving and eight of the last nine. Not exactly a good tradition. The 2-7 Lions have now sold out four of their first five home games. ALLEN PARK -- Participation in Lions practice today (Thursday) was improved with five players who sat out Wednesday back in action. That included starters WR Calvin Johnson (knee), MLB DeAndre Levy (ankle), TE Tony Scheffler (shoulder) and DT Corey Williams (shoulder/groin), along with LB Bobby Carpenter (toe). RB Jahvid Best (toe) was still out, but it’s not uncommon for him to miss practice during the week and play on Sunday. DE Cliff Avril (quadriceps) remained out. Avril did not play on Sunday at Buffalo. Also out were: QB Matthew Stafford (right shoulder) and RB Kevin Smith (who will have surgery on his thumb today). Kicker Jason Hanson, who has an injured right knee, was going through the kicking motion, but did not actually kick the ball. It will be determined later in the week if he’ll be ready to play on Sunday at the Dallas Cowboys. Dave Rayner kicked for the Lions last Sunday and will go this Sunday if Hanson is not able. ALLEN PARK -- Lions running back Kevin Smith underwent surgery on his thumb today (Wednesday) and will not be available to play on Sunday at Dallas. Smith has provided a spark to the mostly anemic run game, especially in recent weeks. He will be missed. Coach Jim Schwartz did not give a timetable for his return, but said he will not play Sunday. Smith injured the thumb in Sunday's loss at Buffalo. 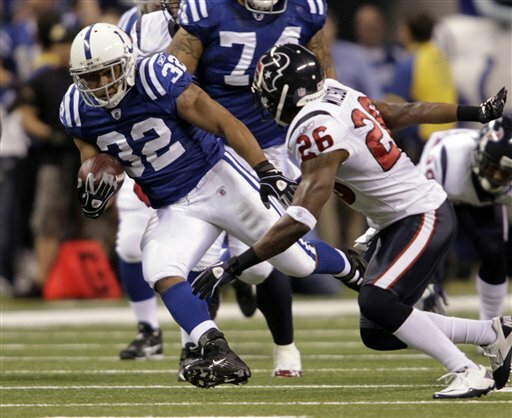 Running back Aaron Brown, who was inactive the last six games, will be added to the mix. Smith missed the first three games of the season because he was coming back from ACL knee surgery. In the last six games he has carried the ball 34 times for 133 yards and had 11 receptions for 123 yards. His absence is a hit for the Lions’ rushing offense which is ranked 30th in the NFL. ALLEN PARK -- Seven starters were among the 10 Lions sitting out practice today (Wednesday) in preparation for Sunday's game at Dallas. Curiously, QB Matthew Stafford, who is usually on the field during practice, was nowhere in sight. Wide receiver Calvin Johnson was on the field but not participating, as was tight end Tony Scheffler. Others not practicing included running backs Jahvid Best (toe) and Kevin Smith (knee). It could be both were given the day to rest. Best was on the field, Smith was not. Linebackers DeAndre Levy (ankle) and Bobby Carpenter also were out. Also missing were two starting defensive linemen -- DE Cliff Avril (who missed Sunday’s game with a quadriceps injury) and DT Corey Williams who had a groin injury last week, but played on Sunday. Also, RB Ian Johnson had his first practice. He was signed to practice squad on Tuesday to replace WR Mike Moore who was placed on practice squad injured reserve. You may remember Johnson from the Fiesta Bowl in 2007. He was the Boise State player who proposed to his cheerleader girlfriend in the frenzy on the field following the game. He was released from the Arizona Cardinals’ practice squad on Sept. 27. Even with all of his success Kid Rock never, ever forgets his hometown roots. So it makes perfect sense that he will perform at half-time of the Thanksgiving Day game (Nov. 25) when the Lions host the New England Patriots. Kid Rock, whose real name is Bob Ritchie, was given a game ball on Oct. 10 after the Lions won their first game of the year, beating the Rams. 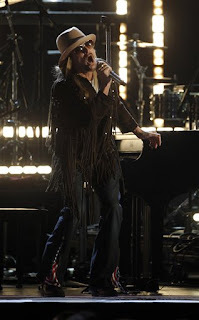 Kid Rock had purchased 500 tickets to the game for the National Guard and Paralyzed Veterans Association. He has a history of giving back to the community and has made several trips overseas to perform for the troops. Give the Lions this much, they have not given up. And they are not a happy bunch especially after the devastating loss on Sunday at Buffalo. “You’ve got to be upset and be mad and be willing to do something about it. When we lose around here people are (ticked) off for a few days and that’s a good thing. And that’s a thing that hasn’t happened in the past here,’’ center Dominic Raiola said. The 2-7 Lions have seven games remaining starting on Sunday at Dallas. The fact they’re still fighting says something for their character and that the coaching staff is forging them in the right direction. The news Monday night that Lions quarterback Matthew Stafford will not undergo surgery for his shoulder injury, is good news for the Lions and their fans. It appears there is a good chance he could be back on the field this season. In three starts this season Stafford has six touchdowns and just one interception. After an exam by noted orthopedic surgeon Dr. James Andrews on Monday, it appears Stafford will rely on rehabilitation to get his shoulder healed. Stafford injured his right/throwing shoulder late in the home game against the N.Y. Jets on Nov. 7. The next day coach Jim Schwartz said that surgery was not an option at that point. Andrews’ opinion confirms that Stafford will not have surgery, at least as it appears now. That means Stafford could return this season. If it was so serious that he could not come back, they would have placed him on the injured reserve list to clear a roster spot. Also the statement said he will continue the rehabilitation that he started last week under the supervision of the team’s medical staff. The team has never specifically said what he injury is although it is believed to be a shoulder separation and it’s the same shoulder that was separated in the opener on Sept. 12. Stafford has started in just three of the Lions’ first nine games this season. He first injured this same shoulder near the end of the first half of the season opener at Chicago. He came back and started against the Washington Redskins in which he threw four touchdown passes on the way to a 37-25 win. He also started at Ford Field against the N.Y. Jets which the Lions lost 23-20 in overtime. Last year in his rookie season, he started just 10 games and was out with a left shoulder separation and a displaced knee cap. Stafford was the first overall pick in the 2009 draft. He does not have his arm is a sling and does not seem to favor it when he walks. Last week he was on the field observing every practice. Shaun Hill, who broke his left forearm four weeks ago and was back in action on Sunday at Buffalo, is expected to get the start this Sunday at Dallas. Andrews is based in Birmingham, Ala., and is also expected to examine Vikings quarterback Brett Favre this week. ALLEN PARK -- Matthew Stafford visited Dr. James Andrews, the orthopedic specialist in Birmingham, Ala., on Monday and is on his way back to Detroit. That’s all we know at this point. However, the media will be given an update on his status on Monday night sometime after 8 p.m. So stay tuned to Lions Lowdown and TheOaklandPress.com web site. Will flash first news on Twitter @PaulaPasche. Stafford injured his right/throwing shoulder late in the Nov. 7 game against the Jets. Expect to hear whether surgery will or won’t be performed, if he will or won’t be placed on injured reserve or maybe that he’s close to returning. ORCHARD PARK, N.Y. -- Lions quarterback Shaun Hill looked a little rusty early in the 14-12 loss to the Bills, but it could have been a combination of factors including not being able to run the ball. He had not played since Oct. 17 when he broke his left forearm in the loss at the Giants. He had screws surgically implanted in the break. After Matthew Stafford went down a week ago, Hill got the nod again. He practiced all week with the starters and on Sunday he wore a half-splint for protection. He completed 29 of 50 passes for 323 yards, threw one touchdown and one interception. Hill seemed to improve as the game went on and led the Lions on a 15-play, 88-yard touchdown drive that put them in position to tie the game but they missed on the two-point conversion. It was Hill’s sixth start of the season and he’s likely to go again next Sunday in Dallas. ORCHARD PARK, N.Y. -- Rookie Amari Spievey will get his second straight start at strong safety today against the Buffalo Bills. Last week when he was in for the injured C.C. Brown (knee), Spievey had five tackles. Brown is back today. Also Turk McBride will start at defensive end in place of Cliff Avril (quadriceps). Zac Robinson will serve as the third quarterback behind starter Shaun Hill and Drew Stanton. Matthew Stafford (right shoulder) is in attendance. Dave Rayner will start for Jason Hanson (right knee). Hanson made the trip for moral support. Other inactives are LB Isaiah Ekejiuba (knee), RB Aaron Brown, WR Derrick Williams and T Jason Fox. With Avril out Lawrence Jackson is active for just the second time in the last five games. A light rain has been falling on and off at Ralph Wilson Stadium. This could be a dangerous game. The Bills are desperately seeking their first win while the Lions are looking to move forward with Shaun Hill at quarterback. 1. Run the ball effectively. This has not been happening. Right guard Stephen Peterman said they are close, but all 11 guys on offense must play their roles to get the running game in gear. It should help that the Bills are the worst in the league at defending the run. 2. Protect the quarterback. Obviously this is the goal each game, but Shaun Hill is just four weeks away from breaking his left forearm. If he gets smashed into, it could be bad news. 3. Don’t miss tackles. Last Sunday the defense tackled well for the first 58 minutes or so, then fell apart which helped cost the Lions the win. At the end they were trying to go for the kill instead of using leverage and playing smart. 4. Stop the big plays. Again, it takes just one or two big plays to lose a game. See 23-20 overtime loss to Jets last week. 5. Forget about the road losing streak which is at 24 straight, tied for the NFL record. Most of the Lions don’t give it much thought because they were not here for most of it. But even those who are in their second season have their hand in a dozen of them. Most of the week the Lions’ spotlight has been on quarterback Matthew Stafford and his ailing shoulder. On Sunday it turns to Shaun Hill who will be getting his sixth start this season for the Lions (2-6) when they face Buffalo (0-8). It will be four weeks on Sunday since Hill broke his left forearm (his non-throwing arm) while trying to brace himself getting up off the field at the New Meadowlands. It seems quick to throw him back in there, but he has been cleared by doctors. 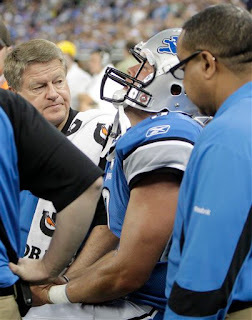 And the Lions, under coach Jim Schwartz, tend to err on the side of caution when it comes to injuries. So you’ve got to believe he is going to be fine. Hill has only missed two starts so he does not expect there to be any rust. “We were just playing with him three weeks ago. It’s almost like he was never gone. You hate to dismiss Matthew like that, but you have to move on,’’ center Dominic Raiola said. Under Hill the Lions were 1-4. He’s completed 127 of 208 passes for 1,309 yards with nine touchdowns and seven interceptions. He seemed to get more comfortable with each game and had zero interceptions in his last two starts -- the win over the Rams and the loss at the Giants. He started throwing last week prior to the Jets game and was the designated third quarterback. “I started doing as much as I could as soon as I could. Last week I was getting back in it, knocking the rust off so everything is all good now,’’ Hill said. He’s had all week to work with the starters which should be another plus. ALLEN PARK -- Dave Rayner, a Lions fan when he was growing up in Oxford, was watching Sunday’s game against the Jets from his home in Rochester. “I was watching, saw (Jason Hanson) get hit, then he came back and kicked later in the game so I didn’t think much of it. He’s been hit before and come back in the game,’’ Rayner said. “I got a call a call on Monday morning. It took me about 40 minutes to get down here,’’ he said standing in the locker room at the Lions’ practice facility. Since he graduated from Michigan State in 2005, Rayner has played for several different NFL teams. In fact this is his second time with the Lions. The first was in the 2008 preseason. “These actually matter a lot more. Preseason is not as important. My mindset is still the same, go in and do well and make field goals and try to help the team win,’’ Rayner said after Thursday’s practice. He will kick for the Lions in Sunday’s game at the Buffalo Bills in place of Hanson who has a knee injury that will keep him out. The 28-year-old Rayner has played for the Green Bay Packers, Kansas City Chiefs, San Diego Chargers, Miami Dolphins, Cincinnati Bengals (twice) and Washington Redskins. The Bengals signed him in February, but released him on Sept. 4. His wife Louise and her mother will drive to Buffalo to see the game. ALLEN PARK -- Starting defensive linemen Cliff Avril (quadriceps) and Corey Williams (groin) were back at practice today (Thursday) after sitting out Wednesday’s session. Also returning after a day off were running back Kevin Smith (knee) and right guard Stephen Peterman. Kicker Jason Hanson was on the field, wearing a helmet and going through kicking motions. He is expected to miss Sunday’s game which is why they signed Dave Rayner. Still missing from practice were quarterback Matthew Stafford and linebacker/special teams Isaiah Ekejiuba. The Lions (2-6) play at the Buffalo Bills (0-8) at 1 p.m. on Sunday. ALLEN PARK -- Quarterback Shaun Hill will start for the Lions on Sunday at Buffalo, but Matthew Stafford has not been written off for the remainder of the season. “It’s yet to be seen. I think there’s definitely a possibility (to play again this season) and then other times you don’t know, so we’ll see,’’ Stafford said on Wednesday. The second-year quarterback injured his right/throwing shoulder in the overtime loss to the Jets on Sunday and could not finish the game. On Wednesday coach Jim Schwartz stuck to his policy of not revealing specifics about injuries when it came to Stafford. But he did indicate that because Stafford and Jason Hanson (knee) were not placed on injured reserve that should be a good sign. Stafford, whose arm was not in a sling, said he still had soreness in the injured right shoulder and will have further consultations with doctors. 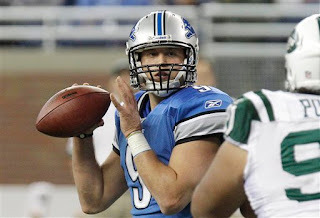 “I’ve got to get some swelling and soreness out and we’ll move from there,’’ Stafford said. He would not say if it is worse than his separated shoulder early in the season. He also would not say if surgery is an option. “I have to talk to doctors first to see if they think (surgery is) an option or not,’’ Stafford said. Hill broke his left forearm on Oct. 17 against the Giants. He was the third quarterback on Sunday but could have just handed off had he been brought into the game. Schwartz said Hill has been cleared to play. Hill said last week his cast covered his hand while the new cast does not. Hill took reps with the starters in Wednesday’s practice. Zac Robinson, who was signed Tuesday, will serve as the third quarterback on Sunday at Buffalo. ALLEN PARK -- Shaun Hill practiced as the Lions No. 1 quarterback today (Wednesday). That does not mean he will be the starter on Sunday at the Bills, but it’s an indication he is in the mix. Hill broke his non-throwing forearm on Oct. 17 and just started throwing last week. Matthew Stafford was at practice and was not wearing a sling on his right injured shoulder. Quarterback Zac Robinson, who was signed as a backup, practiced. Robinson was picked up off the waiver wire from Seattle. He had been a seventh-round pick out of Oklahoma State of the Patriots in April’s draft. Kicker Dave Rayner (Michigan State) also practiced. He was signed on Tuesday to fill in for Jason Hanson who is expected to miss two to three games with a knee sprain. Two starting defensive linemen -- Cliff Avril and Corey Williams -- did not practice. Starting safety C.C. Brown who did not play on Sunday with a knee injury was back at practice. Others sitting out were: running back Kevin Smith, right guard Stephen Peterman and linebacker/special teams Isaiah Ekejiuba. Kicker Dave Rayner was signed by the Lions today to fill in for Jason Hanson who is expected to be out two to three weeks with an MCL sprain. To make room on the roster, cornerback Jonathan Wade was released. Wade started the first four games this season, but lost his starting role to Alphonso Smith. He played nickel back until last week when Brandon McDonald took over. Rayner, who kicked at Oxford High School, played at Michigan State. He was drafted by the Indianapolis Colts in 2005 and has also played for Green Bay, Cincinnati (twice), Kansas City, San Diego, Miami and the Washington Redskins. Rayner was with the Lions in the 2008 preseason and was six for seven on field goals while Jason Hanson was rehabbing an injury. He spent the past offseason with the Bengals and was cut on Sept. 4. Lions quarterback Matthew Stafford could be done for the season, according to a report from MLive.com. This has not been confirmed by the team. Stafford injured his right/throwing shoulder late in Sunday’s overtime loss to the Jets. According to the report it is a grade 3 separation which means there’s tearing of the ligaments and capsule surrounding the joint and it could require surgery. This is the same shoulder that Stafford injured in the season opener at Chicago. Coach Jim Schwartz said on Monday that from his knowledge this was not an aggravation of that injury, it was a new injury. In a radio interview on Monday night, Stafford would not spill much information. He said he did hurt the shoulder earlier in the game, but not seriously enough to knock him out of action. Stafford said he didn’t think he would play on Sunday. This is new and frustrating territory for him. He said he never missed a game in high school or college because of an injury. This is his fourth significant injury in his first two seasons in Detroit. Last season he had a kneecap separation and a left shoulder separation. He had knee surgery before the season was over. This year it’s been two separations of his right shoulder. In his three starts this season Stafford has thrown six touchdown passes and just one interception. Shaun Hill, who started five games in his absence, is recovering from a broken left forearm, his non-throwing arm. Schwartz said Hill “could potentially be ready” to play on Sunday at Buffalo. If not, Drew Stanton will get the start. ALLEN PARK -- No definitive word from Lions coach Jim Schwartz today on the status of quarterback Matthew Stafford after he injured his throwing shoulder on Sunday. Although the coach did say surgery did not appear to be an option. Cornerback Chris Houston saw Stafford at the place where they get MRIs. He said Stafford’s arm was in a sling and he flashed him the peace sign. Schwartz also didn’t say whether Shaun Hill (who broke his forearm three weeks ago) would be ready to play on Sunday at Buffalo. After Sunday’s game Hill said he was not certain if he would be ready. He started throwing last week. If Hill can’t go, Drew Stanton will get the start and the Lions might have to look at signing another quarterback. Houston said he will play on Sunday. He dislocated his left shoulder and had it popped back in on the sidelines. He went back in to play, but had to come out because he couldn’t raise his left arm high enough. Kicker Jason Hanson, whose right knee was injured during a roughing the kicker call, will miss some time according to Schwartz. A new kicker will likely be signed for the interim this week. No word on DE Cliff Avril who injured his leg. Houston did say there were five Lions set for MRIs. When an opponent calls the Lions one of the dirtiest teams ever, is that a good thing? Jets linebacker Bart Scott had a few things to say after the Lions lost to the Jets 23-20 in overtime on Sunday. “They’re a good football team but by far the dirtiest football team I’ve ever played against since I played the Tennessee Titans. They are the dirtiest team I’ve played against. Some of the stuff they do out there I understand, but I’ll just be happy with the victory,’’ Scott said. Pretty strong stuff especially since he was on the winning side. DETROIT -- When Matthew Stafford went down with six minutes left on Sunday, he landed on his right shoulder. Immediately he reached for it and found his way off the field. It looked like he knew it was bad right away. Trainers and doctors examined him on the sideline. Soon he exchanged his helmet for a ball cap and finished watching the game play out to a 23-20 overtime loss to the N.Y. Jets. At this point, no one knows (or is telling) the seriousness of Stafford’s injury. It’s his right shoulder, the same one that was separated when Chicago Bears linebacker Julius Peppers drove him in to the turf at Soldier Field in the season opener. He missed five starts. Last year in his rookie season he sustained a separation of his left shoulder and had surgery on his right knee. He missed a half-dozen games. On Sunday Stafford did not talk to the media. Schwartz said he was very sore. In hindsight, of course, it would have been the right thing to do. Drew Stanton went in and could not convert on a third-and-7. He dumped off a short pass to Jerome Felton that was incomplete and stopped the clock which was great for the Jets. Shaun Hill was listed as the third quarterback, but it had only been three weeks to the day since he broke his forearm in the loss at the Giants. The day after the injury he had screws inserted into the broken bone. “He was active only to hand the ball off. He couldn’t have done anything other than take a snap and hand the ball off,’’ Schwartz said. Hill started throwing in practice last week, but is not sure when he will be ready to play. Hill said the injury to Stafford should not make a difference in his timetable. “The way I look at it I’m trying to get back as fast as possible no matter what,’’ said Hill who started five games in Stafford’s absence. 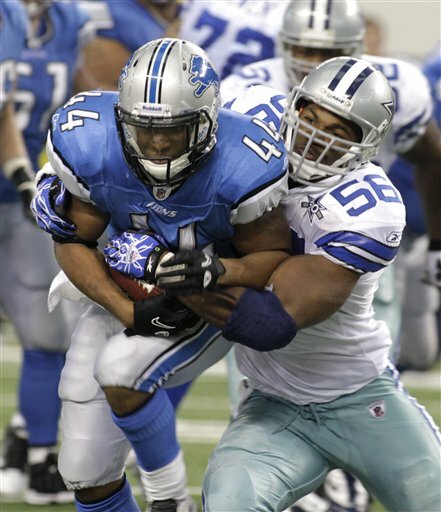 The Lions play at Buffalo on Sunday, followed on Nov. 21 by a game at Dallas, Stafford’s hometown. 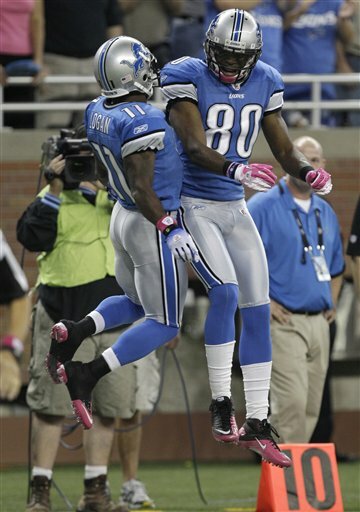 DETROIT -- Lions rookie Amari Spievey will start against the Jets in place of safety C.C. Brown who will sit today’s game out with an injured knee. It’s not really a surprise because Brown was not able to practice all week. Spievey filled in last Sunday after Brown was injured. He had some plays that he looked like a rookie, but also made a few that proved he deserves the start. Spievey is making the change to safety after playing cornerback at Iowa. It's his second start. Linebacker Isaiah Ekejiuba, who plays on special teams, also will not play with an injured knee. 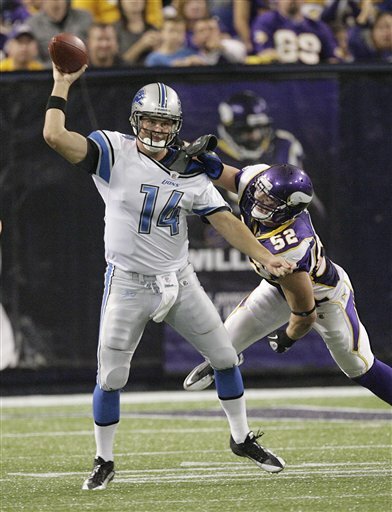 Shaun Hill, who broke his arm three weeks ago in the loss at the Giants, will serve as the third quarterback. He practiced on a limited basis this week. Also inactive for the Lions: RB Aaron Brown, T Jason Fox, C Cody Wallace, DE Willie Young and DE Lawrence Jackson. 1. Get the run game going early. Had trouble with this last week, but managed to get it turned around when Kevin Smith got the hot hand. Jahvid Best said his toe feels fine and he’s ready to go. Lions have not done well gathering yards on first downs. It’s an emphasis and will help get the passing game going. 2. Stop the run. The Jets’ LaDainian Tomlinson may be a veteran but he hasn’t lost a step. It’s like he fell into a time warp. The Lions’ defense seems to be improving week to week this is one area they must step up. 3. Matthew Stafford must play with his ‘A’ game from the get-go. Last week he was rusty in the first half. It was excused because he had missed five starts. He needs to pick up where he left off in the second half against the Redskins. 4. The Stafford to Calvin Johnson connection must continued. Johnson had nine catches last Sunday, including three for touchdown passes. If the Jets use man coverage on him, this should not be an issue. But look for them to bring in a free safety over the top. Revis Island could get exposed against Johnson. 5. Once again, they must play to the bitter end and don’t let a slow start or mistakes rattle them. They had to come from behind against the Redskins and they just did it. Obviously it’d be better not to get behind, but if they do they need to keep the right mindset. There’s no reason to believe they won’t -- they’ve done it all season it’s just that most times it did not lead to a win. ALLEN PARK -- It looks like Lions rookie Amari Spievey will start at safety opposite Louis Delmas on Sunday vs. the Jets. C.C. Brown, the usual suspect, did not practice today (Friday) and has not practiced all week after injuring his knee in Sunday’s win over the Redskins. Brown is not officially out for Sunday, but it’s unlikely he will play. After Brown went out on Sunday, Spievey stepped in which gave the coaching staff the opportunity to see what he can do. “We all believe he can do it there’s no doubt. ...’’ defensive coordinator Gunther Cunningham said. Spievey doesn’t want to let the coaches down. Also missing from practice was linebacker Isaiah Ekejiuba who also injured his knee on Sunday. Ekejiuba said on Thursday that his knee was feeling better day to day. Running back Kevin Smith (knee) was back at practice after sitting out on Thursday. ALLEN PARK -- Lions president Tom Lewand issued a statement on the death of Sparky Anderson who died today at the age of 76. “On behalf of the William Clay Ford family and the Detroit Lions organization we extend our deepest sympathies to the Anderson family, the Detroit Tigers and the legions of Sparky Anderson fans in Detroit and across the country. ALLEN PARK -- On Sunday the Lions will team up with the Pancreatic Cancer Action Network to help increase awareness of pancreatic cancer at the sold-out game against the N.Y. Jets. Team president Tom Lewand will represent the Lions who helped sponsor the Pancreatic Cancer Action Network’s “Links for the Cure” golf and PurpleStride fund-raisers this summer that combined to raise $275,000. Also, volunteers from the Pancreatic Cancer Action Network will hand out purple wristbands as fans depart Gate A at Ford Field after the game. The Lions were touched by pancreatic cancer during director of security Ricky Sandoval’s fight against the disease. Ricky lost his courageous three-year battle in July 2009. His wife, Gael, continues Ricky’s battle by bringing awareness to pancreatic cancer. To learn more about pancreatic cancer visit www.pancan.org. 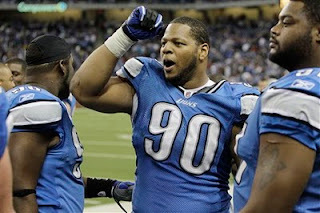 ALLEN PARK -- Defensive tackle Ndamukong Suh was named the NFL defensive rookie of the year today (Thursday). 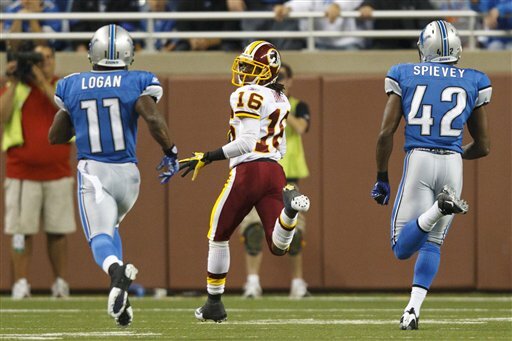 Also, Lions return specialist Stefan Logan was named the NFL’s special teams player of the month. Logan averages 29.5 yards per kickoff return and 13.1 yard on punt returns. He returned a kickoff 105 yards for a touchdown in the win over St. Louis on Oct. 10. In Suh’s first seven NFL games he has collected 6.5 sacks, 27 tackles, one recovered fumble that he returned for a touchdown and one pass defense. This marks the second straight month that a Lions rookie was honored. 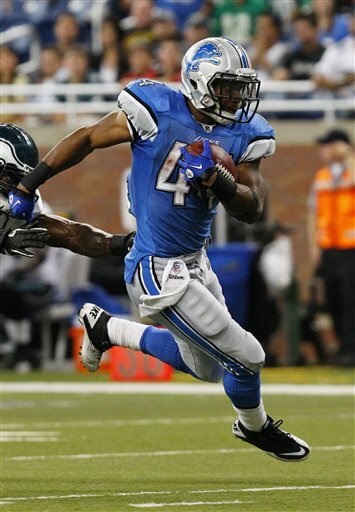 Running back Jahvid Best was the NFL’s offensive rookie of the month for September. ALLEN PARK -- Lions quarterback Shaun Hill participated in practice today (Thursday) for the first time since he broke his left forearm in the game against the Giants on Oct. 17. Sitting out practice was running back Kevin Smith (knee) who was limited in practice on Wednesday. Also out were safety C.C. Brown and linebacker Isaiah Ekejiuba, who both sustained knee injuries on Sunday. Neither has practiced this week and neither has been ruled out for Sunday. ALLEN PARK -- The Lions have sold out for Sunday’s game against the N.Y. Jets at Ford Field to lift the TV blackout. Team president Tom Lewand made the announcement today. He cannot remember the last time the Lions sold out on a Wednesday. Last Sunday’s game against the Redskins did not sell out. The first two home games did, but extensions were needed to get the sellout. “It’s a great testament to our fans, we’ve gotten great support from them all season. Even this past weekend when we didn’t have a sellout, it was loud, they’ve been into the game they’ve given us a great home-field advantage and we couldn’t be happier that they’re responding by getting the game sold out earlier in the week,’’ Lewand said. The Lions are 2-1 at Ford Field and have won two straight. They average 38 points a game on home turf. He wouldn’t be specific on how ticket sales are going for the rest of the season. “Activity has picked up on tickets for the rest of the season,’’ Lewand said. The Jets are 5-2 and coming off a 9-0 loss to Green Bay. The game will be televised on WWJ-TV CBS Channel 2 with Gus Johnson and Steve Tasker calling the game. ALLEN PARK -- All the Lions were presented and accounted for at the chilly outdoor practice today (Wednesday), except for the obvious. Safety C.C. Brown and linebacker Isaiah Ekejiuba, who both injured knees in Sunday’s win over the Redskins, did not practice. On Monday, coach Jim Schwartz would not rule out either one of them for this Sunday against the Jets. We could get an update on them later today. Also, quarterback Shaun Hill (broken forearm) did not practice. The Lions play the Jets on Sunday at Ford Field. An update on the ticket situation is expected later today. ALLEN PARK -- So after a comeback win against the Redskins on Sunday, the Lions know they still have plenty of work to do. The combined record of their next three opponents is 6-15. Can they Lions go on a roll and extend the good feelings from Sunday? The toughest challenge comes on Sunday when they host the N.Y.Jets (5-2) at Ford Field. The Jets are going to be a bit ticked off, because last week when they were coming off a bye week they got beaten 9-0 by the Packers (5-3). The Lions are playing well at Ford Field where they have won their last two. They’re confident, even though they know they didn’t play a perfect game on Sunday. The Jets are three and a half point favorites. Then the Lions hit the road to play at Buffalo (0-7) on Nov. 14 and Dallas (1-6) on Nov. 21. 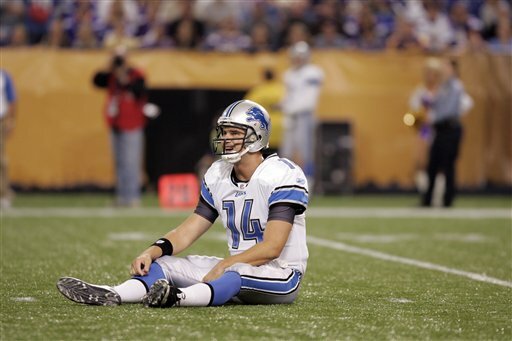 Of course we all know the Lions haven’t won a road game since October 2007. But they are being served up the possibility to snap that streak on a silver platter for two weeks straight. If they can’t top the Jets, it’s understandable. If they can’t go on the road and beat two lousy teams who have one win between them, the Lions aren’t as mentally tough as they should be. That would be a huge problem. Matthew Stafford opened eyes with his four-touchdown performance in the 37-25 win over the Redskins on Sunday. The Lions quarterback has been nominated for FedEx NFL Air Player of the Week for his clutch performance. Stafford, coming back after a six-week absence, completed 26 of 45 passes for 212 yards and four touchdowns with one interception. He needs your help to win. Fans can vote until noon on Friday by going to NFL.com/FedEx. Also nominated are Jason Campbell of the Oakland Raiders and Jacksonville’s David Garrard. Good to see former Michigan running back Mike Hart get the start for Indy on Monday night, even if it was by default. Hart got off to an incredibly rough NFL start when he tore up his knee as a rookie. No surprise to anyone who ever met him that he fought back. He most likely would have had a 100-yard rushing game had he not gone off with eight minutes left in the game after rolling an ankle. Still he had a dozen carries for 84 yards and three receptions for 19. I was the Michigan football beat writer for the entire Mike Hart era and he was a pleasure to cover. Not only was he a good, shifty running back, but he seemed to get it that the media could only help him. By the time he was a senior, when he'd give an answer that he knew was top-notch, he'd smile and wink. Too funny. Sports talk radio folks loved to slam him saying he'd never make it in the NFL. Monday night might be his only NFL start but that he made it that far is a testimony to hard work and football smarts. 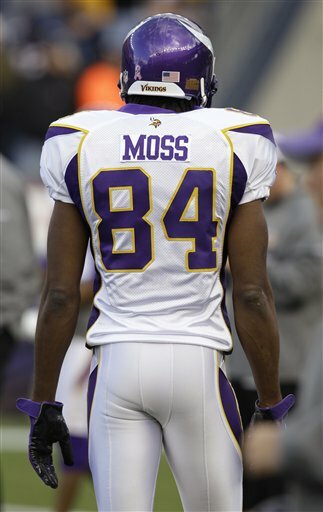 ALLEN PARK -- Reports on Monday were that the Vikings had released wide receiver Randy Moss. Although later in the day it was unclear if that had really happened or if coach Brad Childress had made the call on his own. 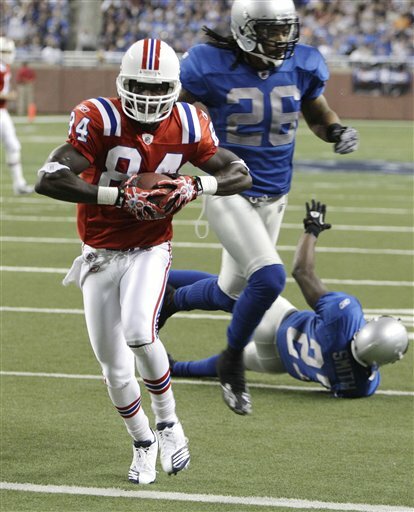 Lions wide receiver Nate Burleson, who played with Moss for the Minnesota Vikings, said he was surprised. “I don’t think Moss had any problem fitting into any locker room. When you’re that type of talent and you want the ball in your hands you make it heard. I heard that’s what happened, I don’t know why he got cut or the reasons he got cut,’’ Burleson said. Early reports were that Miami and Seattle were interested in acquiring Moss. Don’t expect to see him in a Lions uniform. ALLEN PARK -- Coming back from major ACL knee surgery is a tough chore, possibly moreso for running backs. 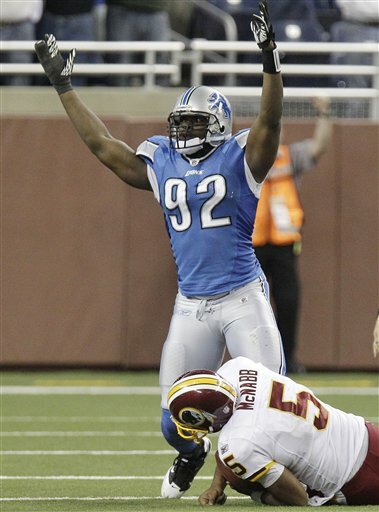 Kevin Smith proved he’s back on Sunday when he was the running back on the field late in the Lions 35-27 win over the Washington Redskins. Smith and rookie Jahvid Best each had a dozen carries in the game. Smith accumulated 51 yards, while Best had 48. It couldn’t have been much closer. Best also had five receptions for 31 yards while Smith had a pair for 16 yards. 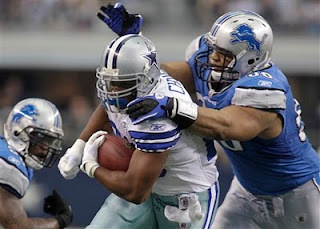 Certainly it wasn’t a perfect running effort for the Lions (102 rushing yards) but they did manage to get the job done. Still, they had trouble running the ball on first down which is something that needs to be addressed. But it was a good game to prove Smith is back. “He’s been waiting for a game like this to come out and do something,’’ center Dominic Raiola said.